a pair of magnificent Swainson's hawks. and they aren't the least bit intimidated by Terry and Me. 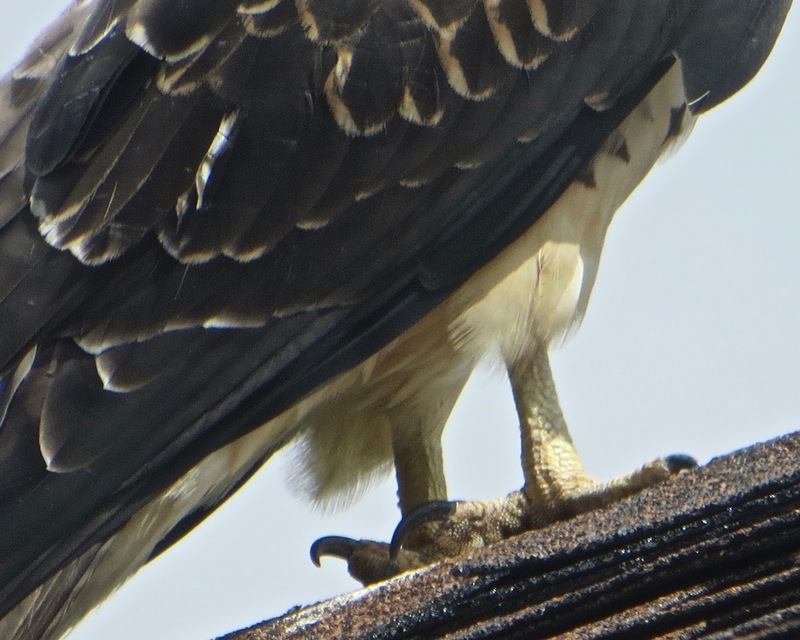 The Swainson's Hawk (Buteo swainsoni), is a large Buteo hawk of the Falconiformes. It couldn't care less that I'm snapping photos nearby! of the prairies and dry grasslands of the American west. 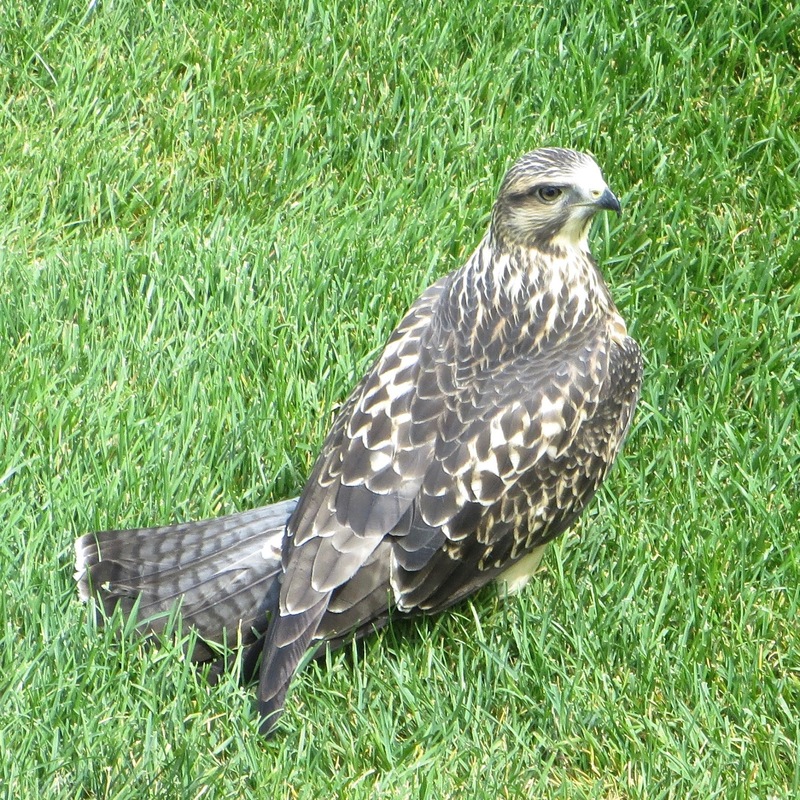 They hunt rodents in flight and sometimes chase after insects on the ground. They especially like locusts and grasshoppers. 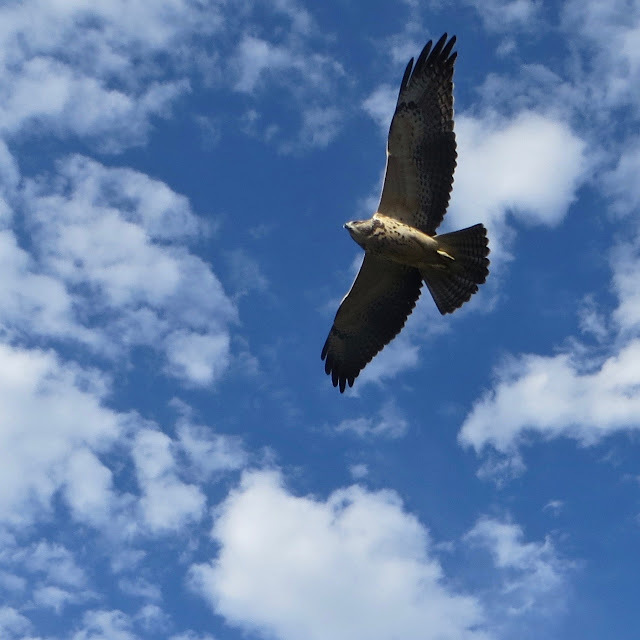 Swainson's hawks are similar in size and in habitat to the Red-tailed hawk. with their black flight feathers, helping to identify them. but these two are fond of our decks and roofs. from our neighbor's and our roofs and decks. The reddish tinge is caused by the way the light is striking the red deck. This one lands the most on our home. 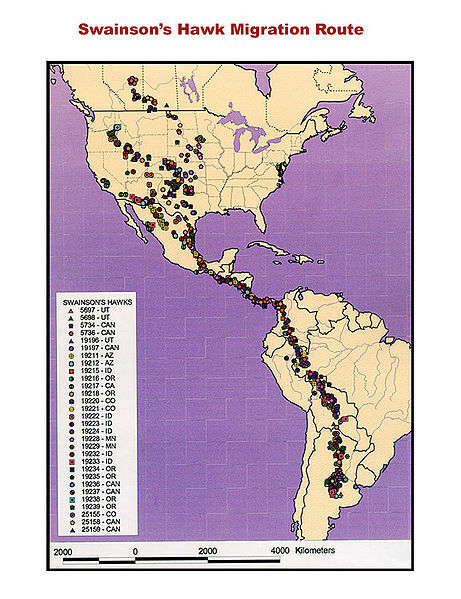 and have one of the longest migration routes of any American raptor. All too soon our unexpected guests will be heading south. It will be quieter and less exciting when they leave! How exciting! They're beautiful. When my daughter was in high school, she took a mini-class on hawks. She became quite a hawk expert and even got to hold some hawks. I forgot to tell you that I used your comment on nicknames in my post for today. They are something, Janie! How wonderful that your daughter had an opportunity to learn about these magnificent raptors ~ and even better ~ to hold some. Thanks for the honor of seeing my comment featured! I was a nice surprise. Nicknames is a topic everyone has an opinion on ~ not to mention sometimes painful memories. Sending you love and hugs! Funny that a few of them make it to the coasts of Virginia and North Carolina. Hi, Sandi! It's nice to see you. Birds are endlessly fascinating! I can't believe some of the feats they accomplish. Have a great evening! I was easily within fifteen feet of this bird, Adam. I couldn't believe it! These hawks are magnificent! Thanks, Jean! I was lucky that they came so close and posed. Catching them on the move was hard! Hope all is well with you, dear friend! What an amazing post, dear Louise! The photos are gorgeous, what beautiful colours and patterns on this bird! I'm so glad that you enjoyed the photos, Linda! I think hawks are so beautiful and fierce! Have a great Tuesday ~ Sending love and hugs! Aren't they magnificent!? We can usually spot hawks on our kayaking trips down the river. We get a lot of cranes and sometimes a bald eagle here and there as well. I could watch these magnificent birds for hours, Theresa! Your kayaking trips must be such fun. Have a good one! They are so much better than kayaking at the beach. The river offers so many more view of wildlife. In addition to the birds, we see a lot of turtles and frogs. Sometimes jumping fish too. I am a huge nature lover and get so excited to see animals in their natural habitats. It's always exciting to see wildlife in its natural habitat, Theresa! I am a huge nature lover, too. My most soul-stirring moments are when I'm in wilder areas. My neighbor told me he watched one sitting on a high fence with a rabbit below. 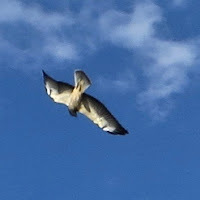 The hawk suddenly dropped straight down grabbing the unsuspecting rabbit in its talons. It ripped the rabbit apart and ate it. My neighbor went out later and found a bit of rabbit fur and a few bones. It's not hard to imagine raptors descending from theropods such as T-rex and velociraptors. I went to let my dogs outside one morning and my back deck looked like a scene from a horror movie. There was blood everywhere and chunks of flesh and rabbit fur all over the place. I'm pretty sure it was a hawk that decided to use my deck as his dining room table that morning. Thankfully, I've only had that happen once in the 9 years I've lived here, but that was one time too many for me! What carnage to face in the morning. I hope you don't have to deal with it again, Theresa! A very handsome bird. This is the first time I see "Swainson's". I had never seen any hawk in person. There aren't any flying around my apartment, only the annoying noisy fat crows flock around my apartment complex all the time. Hi, HD! I had to laugh at your comment about crows. They can make a racket! 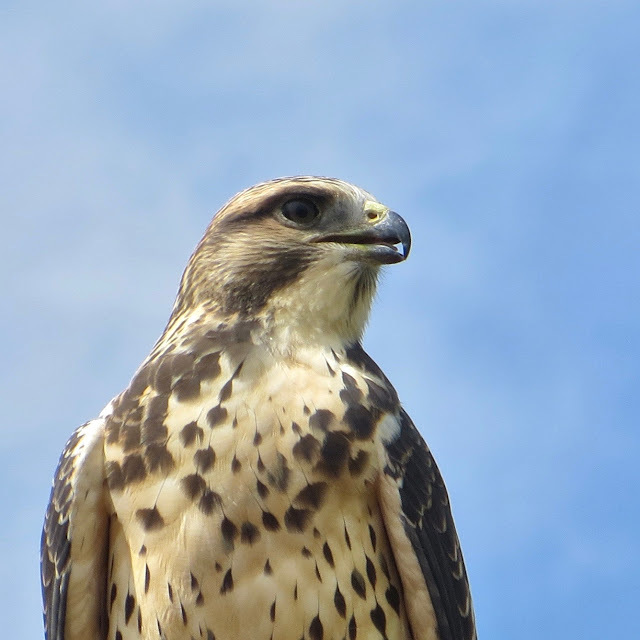 I'm happy that I was able to introduce you to the beautiful Swainson's hawk! I've been working on small projects throughout my home for several years. My biggest accomplishments have been getting rid of decades of teaching materials and my beloved National Geographic collection. Not an easy process, but worth it! Have a good one! What a incredible post this is! Such a long migratory route... No wonder they look exhausted! What sight, congratulations for these fantastic photos dear friend, you must have been so thrilled!!! I meant" what an incredible"!!! I was thrilled, Noushka. I have my camera sitting on the table by our deck door. I run for it every time I hear their cries. I'm so glad that you got to see my pictures ~ they're the best bird photos I've taken! 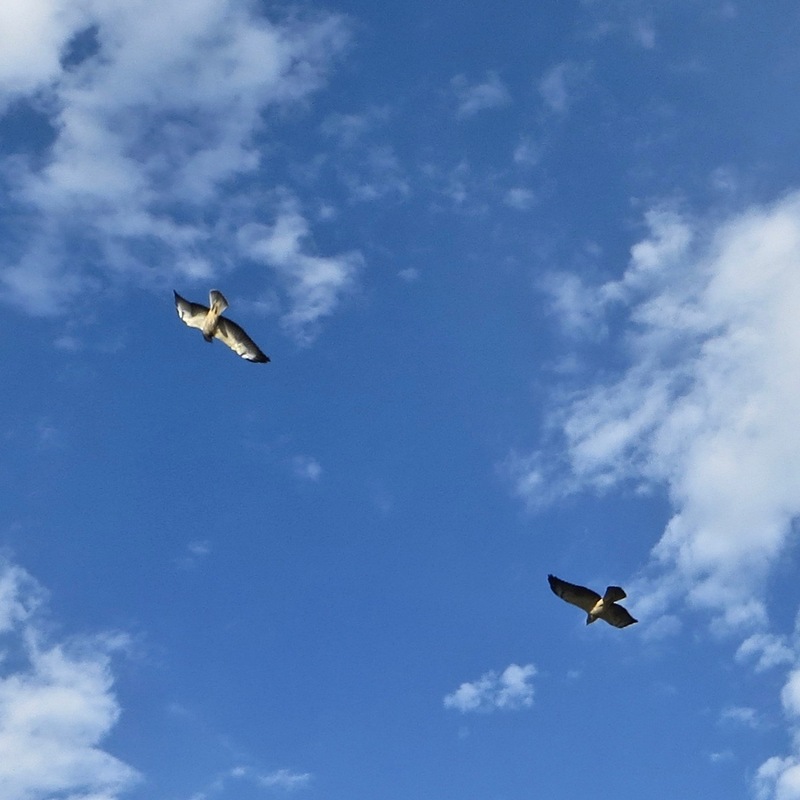 You are such an inspiration with your incredible bird photos! Birds are endlessly fascinating! Love and hugs to you, my dear friend! They sure are quite the sight. And well they let you take pics, they always have their eye on you. Soon you'll all be flying away. "Try and pet me like a dog. I dare you, human." But I know better! 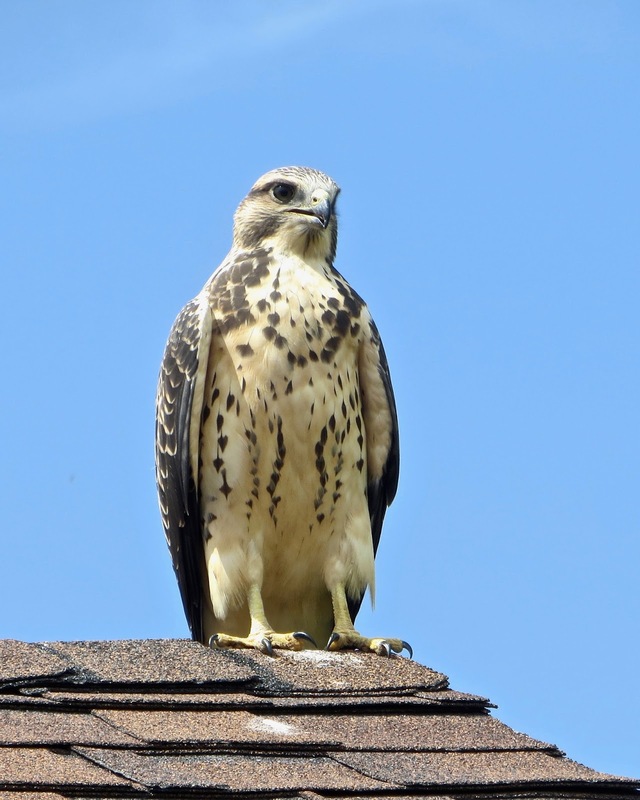 We had a pair of Swainson's hawks nest by the parking lot at my elementary school. They were in a tree just a few feet from the main sidewalk leading to the school. 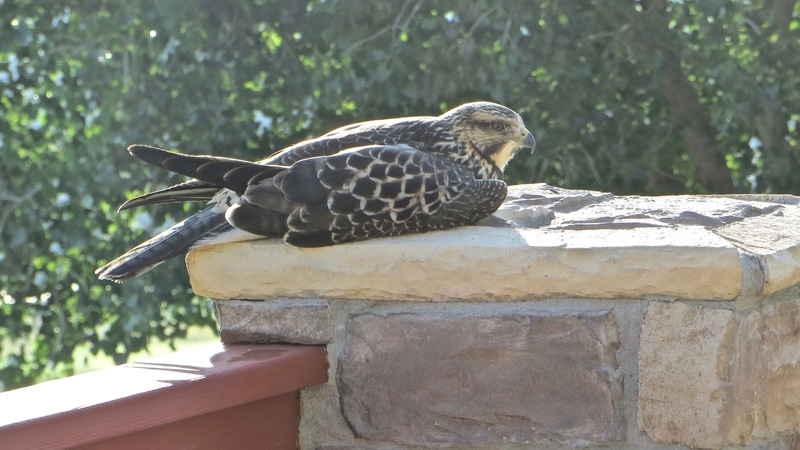 While the hawks' eggs were developing until the one surviving baby fledged, our staff and children were under constant attack. The hawks are an endangered species, so no one could disturb the nest. I think it was the Colorado Parks and Wildlife Department that came and taped off a large area to stay clear of. Four of our staff had to be taken to the hospital after being attacked; some requiring stitches. Many people took to carrying open umbrellas to withstand the attacks. One parent would be on the nest, and the other would be perching on guard on one of the street lamps in the parking lot, ready to swoop down. It was a very exciting time at our school. After the hawks left, Colorado Parks and Wildlife removed the nest which is on display my the school's lobby. Have a good one, my friend! Louise! How exciting! And what great photos you have taken of these gorgeous creatures! You are so lucky, I would be thrilled to see them, let alone get such great pictures of them. The hawks are wonderful, Kay! Late this afternoon the above hawk perched on our deck railing, and I was less than ten feet from him. He stayed about fifteen minutes, and I took a lot of photos. I haven't loaded them yet, but I hope to get another short post on this hawk up soon. Have a great Hump Day! I had a good laugh at your comment I just read!!! I try to imagine the lovely dragons in Game of thrones (I'd love to have one of those as a friend!!!) mating in the sky in a wheel like dragonflies! LOL!!!! But you are right, these insects are quite incredible, the eyes and wing technology are amazing so are their life cycles. Hi, Noushka! Your comment has me laughing! I'm glad that you have a great sense of humor! I'd love to ride one of the GOT dragons. The scene where John Snow stands his ground and faces off with Drogon was amazing. Fortunately, since I can only enjoy imaginary fiery dragons, I have your amazing photos to marvel at the real and fascinating dragonflies around us. They really are magnificent creatures and you are so lucky so see them that close! Sometimes you get lucky, Brian! I can hear one crying nearby right now. Our bunny population has declined, let me tell you! Have a good one, and thanks for visiting! Hi, Al! I have enjoyed watching these beautiful birds. Definitely glad they're not pterodactyls! LOL Have a good one! Hi, Rain! I've been really enjoying watching the hawks. 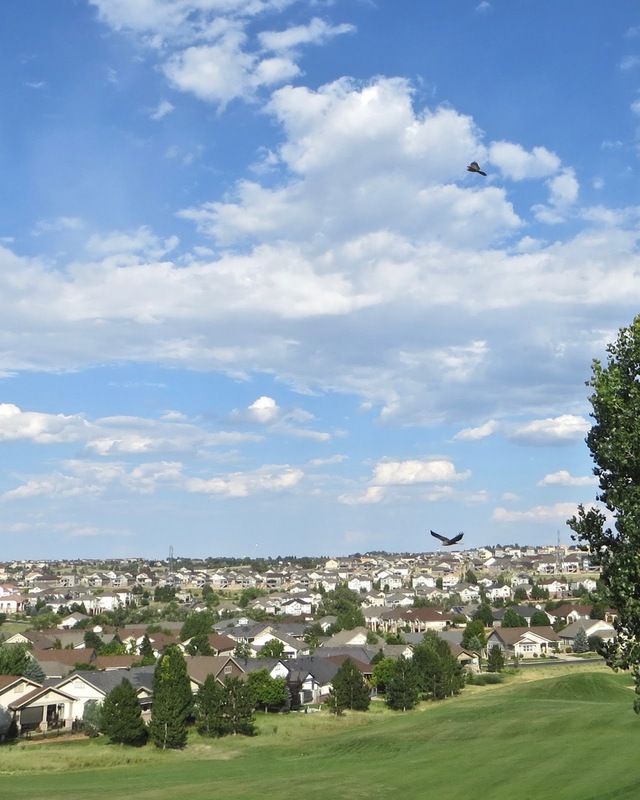 We lost a lot of crows to West Nile Virus about a decade ago, but they are coming back. Fortunately, they're not squawking early in the morning near me!!! Have a good one! You are so lucky to enjoy some of the splendours of nature in your own back-yard. You have a lovely view. They look magnificent creatures. Well captured. I am lucky, Andrew, and grateful every day. 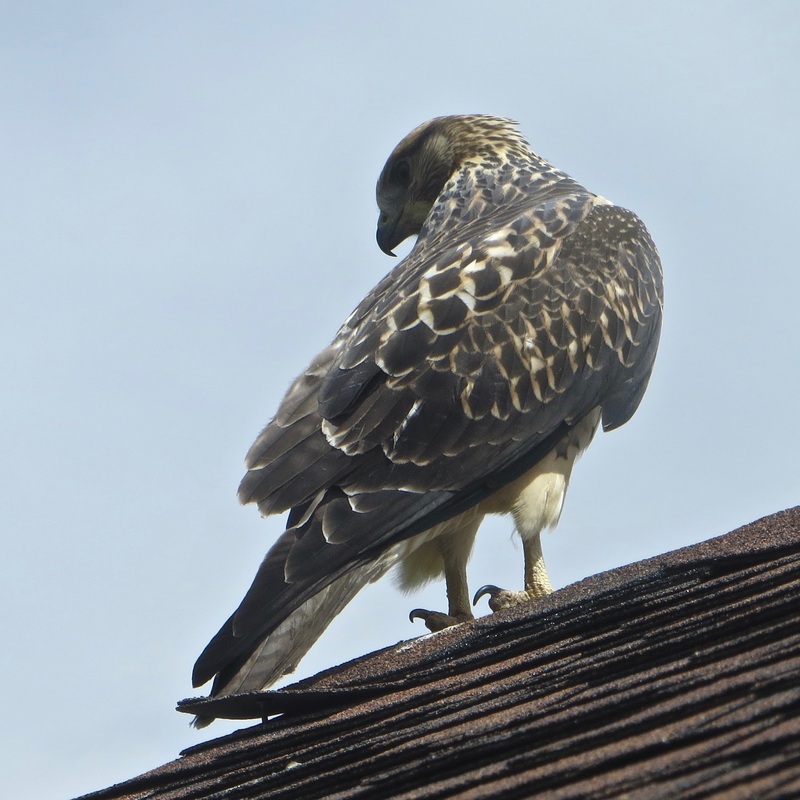 I'm quite amazed that the hawks weren't scared off by my nearby presence. It gave me an opportunity to shoot them with my little point and shoot camera. I've loved having this view. I can see 180º of the horizon, which is really fortunate! I hate being down in a hole or closed in by trees. Have a good one, my friend! Magnificent!! Breath taking! So special!! Terry and you are so fortunate! What an experience!! WOW!! Big Hugs! I'm glad that you enjoyed the photos, Stacy! They are wonderful creatures. Right now we're dealing with more wildlife among us ~ a bee colony in one of our deck posts. The bee guy has just arrived. #1 most important thing ~ He saves the bees! It could be a fascinating day! These are such magnificent pictures! Thanks for sharing. Thank you for visiting and commenting, Gina! Have a good one! Oh my ,Dear Louise i am amazed with your photography as i am seeing it for the first time so i must say that you are bRILLIANT PHOTOGRAPHER my fiend!!!!!! such a beautiful and marvelous creatures and how magnificently you captured them! excellent shots .I can stare at them for sooo long Louise . sorry for miss spell the "BRILLIANT"
Hi, Baili! Thanks for your kind comment! 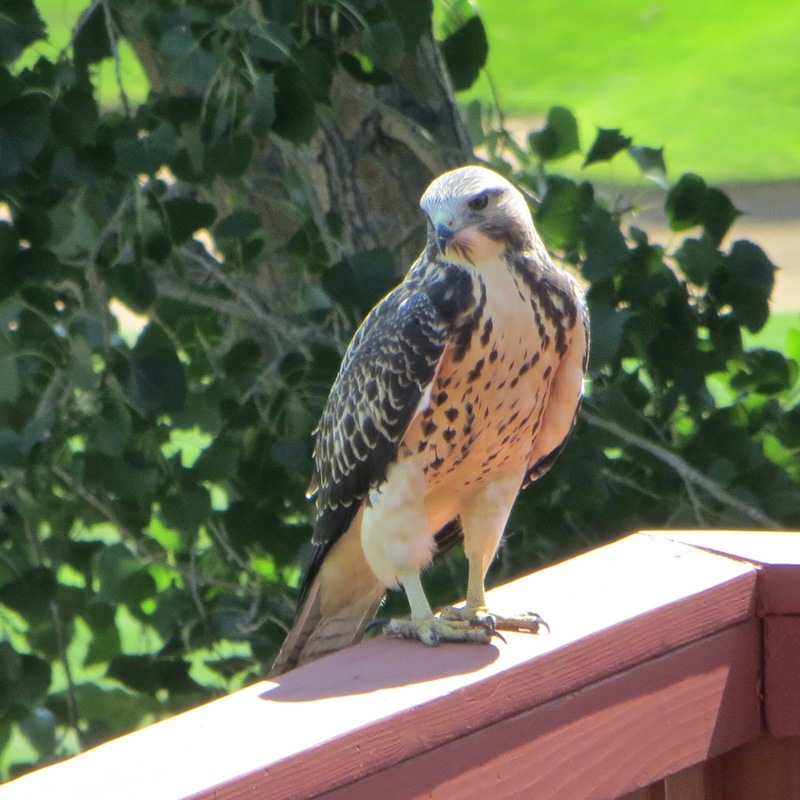 Hawks are beautiful and marvelous, and I thank them for coming so close and making me look brilliant! Have an enjoyable weekend with your loved ones, my special friend! With love and hugs! Wow, absolutely magnificent! These birds are gorgeous. Amazing captures, Louise! Thanks, Martha! The hawks helped me out by not being one bit intimidated by me! Our rabbit population around our house has radically declined! Have a good one!